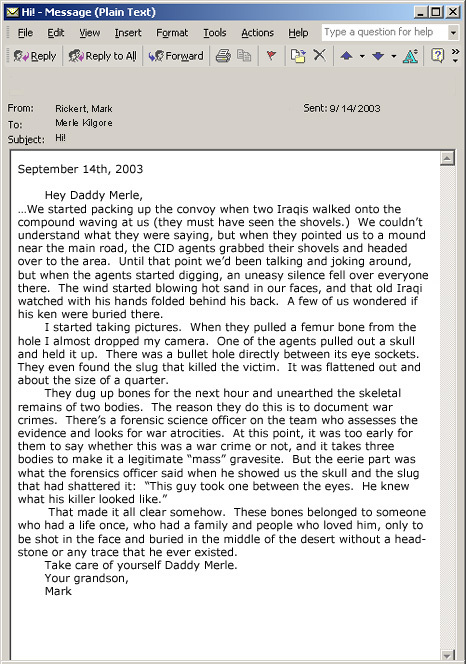 Mark Rickert wrote this email while serving as a journalist with the 372nd Mobile Public Affairs Detachment in Iraq. On this day, he and his group were investigating rumors of a mass grave. The letter is written to his grandfather, Merle Kilgore, who was a friend and manager of Hank Williams, Jr. An audio version of this email read by Hank Williams, Jr., from the Simon and Schuster audiobook Behind the Lines by Andrew Carroll, is part of our online exhibition Battle Lines: Letters from America’s Wars.